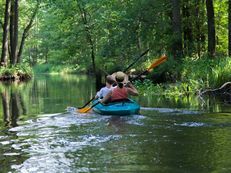 Lübbenau lies nestling in the UNESCO Spreewald Biosphere Reserve and it makes an immediate impression with its charming Old Town and a bustling port quarter for boat trips into the Spreewald. Lübbenau is part of the Upper Spreewald-Lausitz district in southern Brandenburg, about one hour's drive from Berlin. The town was first mentioned in records in 1315 and in 2015 it celebrates its 700th anniversary. Traces of its medieval beginnings can still be found in the historical town centre. The lively port quarter of Lübbenau is a popular starting point for boat trips into the Spreewald. On a guided tour through the historical town centre of Lübbenau, you will get to know the historical and cultural features of the town. The castle district with Lübbenau Castle and the Castle Park designed in the English landscape style forms the oldest part of the Old Town. The bustling port quarter of Lübbenau with its Great Spreewald Port is not far from the Castle. 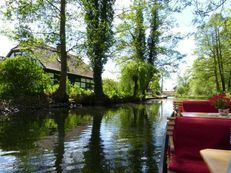 It is one of the most popular starting points for boat trips through the Spreewald. In the summer months, the wooden boats with their lovingly set tables are strung out like beads. Small cafés looking onto the water entice you with coffee and cake, and the gherkin picklers of the town present their range of products on Lübbenau's famous Gherkin Mile. One of the main attractions in Lübbenau are the Spreewald Light Nights in which farmsteads, bridges and streams are bathed in a gaily coloured sea of lights. Boat trips along the illuminated route should be reserved in advance. 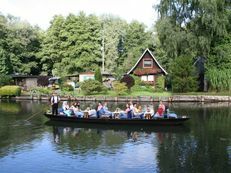 The annual Spreewald concert on the banks of the River Spree combines the unique natural setting of the Spreewald with first-class music. Strictly speaking, Lehde is part of Lübbenau, but it has its own very special charm and village character. 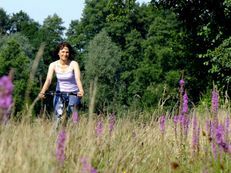 Besides boat trips, well signposted cycle paths lead to the little village known as the "Lagoon Village of the Spreewald". 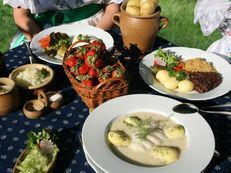 The open-air museum of Lehde offers an authentic glimpse of the life of Spreewald residents 100 years ago.